View of the Capitol Building from the roof of the Voice of America on 330 Independence Ave., S.W. The United States International Communications Reform Act of 2014 (H.R. 4490) has just passed the the House today, next it will go before the US Senate. 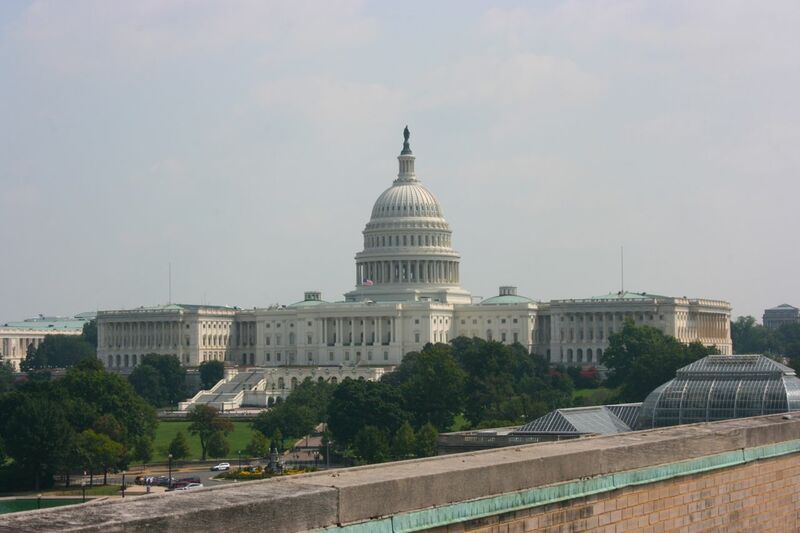 This bill proposes major changes to the overall structure of US international broadcasting. Click here to read previous posts about the bill and read the press release below for more information. We will update the SWLing Post with news about H.R.4490 as it is presented before the Senate–follow the tag HR4490. Washington, D.C. – Today, Rep. Ed Royce (R-CA), Chairman of the House Foreign Affairs Committee, applauded House passage of bipartisan reform legislation to improve the missions, objectives, and effectiveness of U.S. international broadcasters, such as the Voice of America (VOA), Radio Free Europe-Radio Liberty (RFE/RL), Radio Free Asia (RFA), and the Middle East Broadcasting Network (MBN). The legislation, the United States International Communications Reform Act of 2014 (H.R. 4490) was unanimously passed by the Foreign Affairs Committee in April. Chairman Royce and Rep. Eliot Engel (D-NY), the Committee’s Ranking Memberintroduced the legislation in April. Fixes Well-documented Management Problems — Currently, five U.S. international broadcasting entities report to the Broadcasting Board of Governors (“BBG”), a group of 9 part-time individuals, who meet once a month to make management decisions. Important decisions can languish if the Board does not have a quorum, which is often the case. This legislation would establish a full-time, day-to-day agency head and reduce the role of the Board to a more appropriate advisory capacity. These changes have been recommended by the State Department’s Office of the Inspector General and are widely recognized as needed reforms. Clarifies the Mission of the Voice of America (VOA) — The VOA charter states that VOA will provide a “clear and effective presentation of the policies of the United States.” Over time, VOA has abandoned this mission and adopted a mission of the so-called “surrogates” to provide uncensored local news and information to people in closed societies. This legislation makes clear that the Voice of America mission is to support U.S. public diplomacy efforts. For information of Chairman Royce’s efforts to reform international broadcasting, visit www.foreignaffairs.house.gov/broadcasting. This entry was posted in Broadcasters, International Broadcasting, News, Shortwave Radio and tagged BBG, Broadcasting Board of Governors, Consolidated Grantee Organization, H.R. 4490, HR4490, IBB, International Broadcasting Bureau, United States International Communications Agency, United States International Communications Reform Act of 2014, VOA, VOA cuts, Voice of America on July 28, 2014 by Thomas. The New York Times, in a recent article, describes a growing split between the VOA Union (American Federation of Government Employees Local 1812) and VOA journalists over the proposed changes to the VOA mission (via H.R. 4490), which would make it an active voice of American policy. (Many thanks to SWLing Post reader, Marty, for sharing this relevant article). WASHINGTON — Voice of America journalists who are fighting to maintain what they say is their editorial independence are now at odds not only with Congress, but also with their own union. The union, the American Federation of Government Employees Local 1812, recently endorsed a bill that would change language in the charter for the 72-year-old news agency and require it to actively support American policy. That came as a surprise to some Voice of America employees, who said the legislation would make them mouthpieces for government policy. They want the union to withdraw its letter of support. “A lot of us would welcome change and reform, but not at the cost of undermining V.O.A.’s journalistic credibility,” said Jim Malone, a senior national correspondent at the government-financed news agency who is not a member of the union. “In the end, some of the currently entrenched senior management represent a far greater threat to V.O.A.’s journalistic independence, indeed to the very existence of the V.O.A.,” the union wrote. The danger, said the union’s president, Tim Shamble, is that the government could withdraw its financial support if the agency continued its current course. The federation represents about 40 percent of all Voice of America workers and 11 percent of the journalists in the central news division. This entry was posted in Broadcasters, Current Events, International Broadcasting, News, Shortwave Radio and tagged BBG, Broadcasting Board of Governors, Consolidated Grantee Organization, H.R. 4490, HR4490, IBB, International Broadcasting Bureau, United States International Communications Agency, United States International Communications Reform Act of 2014, VOA, VOA cuts, Voice of America on July 3, 2014 by Thomas. Many thanks to Dan Robinson who shares this post on the BBG Watch which outlines major changes to US International Broadcasting. There are many, many more points to this bill thus I would encourage you to read the BBG Watch post in full for all details. This entry was posted in Broadcasters, News, Shortwave Radio and tagged BBG, Broadcasting Board of Governors, Consolidated Grantee Organization, H.R. 4490, HR4490, IBB, International Broadcasting Bureau, United States International Communications Agency, United States International Communications Reform Act of 2014, VOA, Voice of America on April 28, 2014 by Thomas.